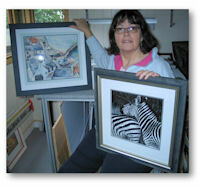 "Janet Rudkin is a rising star in the DIYframing world. Starting out in 2008, she has gone from her Basics of Framing course, with us in Exeter, to setting up her own business: Bystock Framing. Not content with that, she has found time to research her new found craft thoroughly, invest in kit and further training, as well as being a winner in the DIYframing “Summer Holiday” picture framing competition. That has really whetted her appetite to see how far she can develop her skills and is already working on an entry for the Fine Art Trade Guild competition. Her website and blog are also worth taking a very good look at and will certainly fire any would-be bespoke framer with ideas of their own." From a young age I enjoyed drawing and painting (and wanted to be an Art Teacher before leaving school prematurely through family circumstances). I moved from painting with oils to watercolours and finally, about 12 years ago, ventured into photography. I also enjoy messing about on computers and producing my own prints. I belong to my local Photo Group and hope that one day I will have some good photos to frame and hang on my walls! My husband and I moved to Exmouth in 2006. After totally refurbishing our house I was keen to find a creative outlet. I had a go at stretching and framing a canvas we brought back from a holiday in Paris. I really enjoyed the experience. My interests, namely artistic creativity and DIY all seemed to be covered in one activity: I then started looking at framing more seriously. 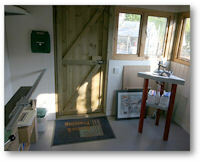 My first training course was in the summer of 2008 with DIYframing at Topsham, very near to my home in Exmouth. I wanted to find out what was involved and to see if framing was something I could take up as a serious hobby/business. I thoroughly enjoyed the 2-day course - ‘the Prof’ was enthusiastic and encouraging. This led me to buy my first framing equipment and set up my workshop. It’s actually in my garden which is great. I can work as much or as little as I like, depending on workload and can fit it around my home life. The only slight down side is that, like all home based jobs, you have to be fairly disciplined to put the time in. The workshop itself is fairly compact (12’ X 9’) but, in the main, I manage quite well with the space. Once I had got started, I spent a day with a professional framer on a tailored one-to-one training course. Using his professional equipment was a real eye-opener. As a result, last June, I invested in the full professional kit: guillotine, underpinner, top range mount cutter and sheet materials cutter. I’ve never looked back. The last couple of updates have been a Fletcher Oval cutter and a Keencut workbench with storage underneath – and just the right height to avoid back ache. I would have preferred to have a longer space where the guillotine is as I don’t have enough space to feed the mouldings in from the left. Initially, I was wasting moulding, but, over time I have become fairly adept at judging where, along the length, to make that first cut. The first picture framing order is always a bit daunting: my first one was quite scary as it was totally out of the blue! My husband was buying some shotgun shells in a local gun shop. He overheard the owner talking about some framing he needed doing. In stepped my husband with my business card in hand and it went from there. Looking back, I’m not sure I was totally happy with the frames I produced at the beginning, but perhaps that’s a natural reaction. I have learned so much, and improved immeasurably since those ‘early’ days, so I suppose it’s quite easy to be self-critical. Like any other craft or art, keeping your framing skills honed is essential. Knowing how to make a frame isn’t the same as being a good framer. There are many ways to keep on top of it all. I am building up my library of framing reference books and I subscribe to Art Business Today, which is a good source of information. The Framers Forum and the DIY Framing website are also good sources of information. In 2009 I attended another DIYframing course led by David Wilkie. I came away from that course totally inspired and buzzing with ideas! Since then, I have concentrated a lot of time in mount decoration and have a keen interest in competition framing. As David showed, you can introduce a number of detail elements into the mount and frame without any constraints and it gets you practicing all sorts of mount and frame decoration ideas. My placement in the DIYframing competition has whetted my appetite and I am currently preparing an entry for the Fine Art Trade Guild framing competition. Bystock Framing is the business I’ve developed. It offers a framing and frame refurbishment service. Business was slow at first and it really only picked up when I decided to invest more time and money in training, equipment and promoting myself. Essentially I offer a bespoke framing service to customers in their own homes. It’s nice to get out and about, meeting people in the relaxed atmosphere of their own house. They like the fact that they don’t have to trudge around framing shops to get their pictures framed. Marketing the business is never easy. You have to be thorough and explore so many avenues. The website www.bystockframing.co.uk is a useful shop window and brings in work. I’ve also made sure Bystock Framing is listed on all of the free business websites e.g. Googleads, Yell.com. I have embarked on a business partnership with a print shop and photographic studio. Most recently I’ve had leaflets designed, to hand out to businesses in the area. I have advertised in a couple of journals, although I didn’t get any work through these. Most importantly, I am really pleased to be getting repeat business and work, through word of mouth. So, business is actually pretty good but I would obviously like it to be busier! I am continually looking at ways of increasing sales. I really enjoy being a self-employed framer and wish that I had discovered framing years ago. What advice would I give anybody starting up? Get some good training under your belt before you ‘go public’ and never stop learning. Finally, with hindsight, I would probably have done some more training before I started: perhaps attending the DIYframing 5-day Business Course. The confidence I would have gained at that early stage would have enabled me to go into the business with more ‘gusto’.